North Korea has threatened to conduct a nuclear test in response to a United Nations move towards a probe into the country's human rights violations. Its foreign ministry on Thursday accused the United States of orchestrating a recent UN resolution calling for the investigation. North Korea previously conducted nuclear tests in 2006, 2009 and 2013. Its threat comes as new satellite images emerge indicating fresh activity at a North Korean nuclear facility. A UN human rights committee on Tuesday passed a resolution calling on the Security Council to refer North Korea to the International Criminal Court for alleged crimes against humanity. Pyongyang said the resolution was based on "fabricated testimonies" from North Korean defectors and "slander against Pyongyang". The resolution's approval was a "grave political provocation" by the US and such "aggression..is leaving us unable to further refrain from staging a new nuclear test." It added that its military deterrence "will be beefed up limitlessly" to guard against the US. A US State Department spokesman said in response: "It would certainly be unfortunate to threaten with that kind of activity in response to the legitimate focus on North Korea's human rights situation by the international community." 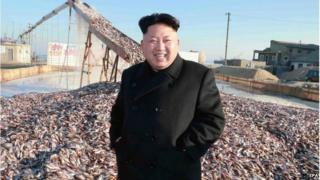 North Korea has previously rejected claims of human rights violations. Following a UN report alleging the country was committing "unspeakable atrocities", a Pyongyang official held a rare open briefing last month where he denied the existence of prison camps, and said there were only detention centres. Tuesday's resolution drew heavily on the report, which was released in February. Analysts however say that it is unlikely that the Security Council will allow North Korea to be tried in the ICC, as Russia and China - which voted against the resolution - sit on the Council. North Korea's nuclear test threat comes as a US research institute published new evidence that Pyongyang may be restarting a plant that can reprocess nuclear fuel into weapons-grade plutonium. The US-Korea Institute posted recent satellite images showing activity at a radiochemical laboratory at the Yongbyon facility on 38 North, its website devoted to North Korea analysis. The pictures show a cooling tower emitting steam, vehicles coming and going, and piles of "grey material" stacked outside a facility believed to be manufacturing fuel. Previous nuclear tests by North Korea provoked international condemnation and sanctions.